Chris M.: Yet another Liberal Quaker with Conservative-leaning tendencies! I knew a birthright Friend on the East Coast a dozen years ago who had grown up in the Albany area, and was then living in Manhattan, just a few blocks away from me. We were near the 15th Street Monthly Meeting. Yet he didn't attend much if ever. In fact, I met Michael at a Friends Committee on National Legislation meeting in Washington, DC. I'll never forget the intense conversation another Friend and I had with him as we walked around the neighborhood near the conference center one evening. We were talking about some aspect of Quakerism. "I have friends who are not at all religious, but I know they are saved!" he said fervently at one point. I almost wanted to back away from him. What was a person who'd grown up Quaker doing talking about whether people were "saved"? And feeling so intensely convinced of the Truth he was conveying -- they were saved -- and that it mattered so much to him? His energy and intensity and conviction burned into me. We never did have much contact, but I do remember that encounter. 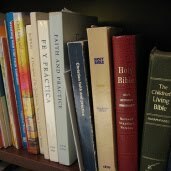 Over at Growing Together in the Light, Will T. writes in this post, "I do not mean to imply that we should have a creed or statement of belief but that we need to find a core understanding of Quakerism that we at least agree to wrestle with to be able to continue as a religious community." I agree! And just how are we to define that core understanding, when many of us have such different vocabularies? Most of the time I think we're describing much the same thing, from different vantage points. But are we? It seems like all of us wonder, at times. God gives to every human being to every human being who comes into the world – regardless of race, religion, gender, or station – a measure of the eternal Light to be inwardly guided by on a daily basis. That Inner Light is supernatural, personal, universal, saving, eternal, persistent, and pure. The chief end of religious life is to learn to listen to and act upon the promptings of this Light under the authority of God and within the bonds of human community. Those who learn to heed the promptings of this Light come to be “saved” – that is, they come into fullness and wholeness of life and right relationship with God, themselves, the universe, and one another. Those who resist, ignore, or otherwise deny the workings of this pure spirit within them, though they profess themselves to be religious, are “condemned” – that is, they become alienated from God, from themselves, from the universe, and from one another. That’s it. That’s the whole enchilada. It was Caldwell's definition of "saved" and "condemned" that had me remembering Michael from New York. These are terms I resonate with. And the agency of free will in choosing one over the other is clear. God has given us that ability, and waits in expectant worship for us to find the Way. Similarly, Will T.'s "This is Eternal Life" speaks to me in a way I might not have been able to hear well a dozen years ago. I found it breathtaking. What do you think? What is your core understanding? Where do you find the Life, the Truth, and the Way? You, Friend, speak my mind. Funny, I got exactly what he meant by "saved" (in the context of assuming that he wasn't a fundamentalist christian) I have meant (I think) pretty much the same thing when I've said that a catholic friend of my is probably a boddhisattva. I am universalist in a radical sense. I tend to believe the really important stuff transcends any human construction about what god looks like, or thinks. Well, I don't actually believe in God, not like that. And I don't actually believe that we are granted a measure of the light - at least not by any decision making body. We simply have it, or, more aptly, are it. I am not happy with myself in that I don't know how to answer the important questions that you pose, Chris - what the heck is my core understanding? where do I find "the way, the truth and the life"? I dont' really know, and part of me thinks I should. And so, wanted to sort of wander away whistling like I hadn't heard the question. I think this discussion is crucial to the society of Friends, but I also am very skittish about the topic, because I find that I experience those who want to have it as also holding views that are distinctly not universalist - I often suspect that they yearn for us, as a society, to find our "core" - but that they have an investment in that "core" being named "Christ" or even "God" - both of which - to greater and lesser extents, exclude me, or at least require me to reign in my spirit, which is not something that I feel called to. Oops, I also meant to say that I think I understand what Liz means (though I'm not sure, of course) but I have a concern about "acquiring" faith - as if it was something that we could own or hold onto, and also as if it were something to be striven for, rather than relaxed into. It was much harder to do the "less" of simply letting myself relax and let sleep take the time it needed in coming. I generally find that faith (hearing spirit?) is much like that. It is thank you. I like seeing where things I write take people. And I like the quote from Caldwell - but maybe that is because I can hear Barclay in his words. And Pam, I hope I don't make you too skittish. One of the characteristics of idolatry is that it is an attempt to take the whole total incomprehensibility that is God and to force it into something that we can understand and therefore control. While we have no problem rejecting idols when they are statues I think we sometimes make idols out of words. So "God" and "Christ" (the words, that is) can become idols if, when we use them, we think that we can possibly understand what they mean. When God came to Abraham to tell him that Sarah would bear a child in a year, God showed up in the form of 3 people. One person wasn't enough to hold it all. I think right now we are up to 6 billion and counting and that still is not enough to hold it all. when none fo men as yet existed. I come to the end --I am still with you. This touches me in a deep place and feels so true. But other times I can get to the same deep place contemplating the miracles of random events that is the nature of evolution. Neither one of these captures God. God is somewhere in the spaces betweem these. And that is why I want to continue this discussion, so that we will find more spaces between to find God in. Thanks for the comments, y'all. I'm definitely a both/and thinker, so here are some "Yes, and..." responses. Liz: Yes, and I would argue the acquisition comes through practice. To quote from a Friends Council on Education pamphlet I just read today about care relationships between Friends Schools and Meetings: "The word practice -- both a noun and a verb -- implies repetion, engaging in an act repeatedly so as to become proficient. These practices are actions that require continual practice in order to maintain dynamic relationship." Pam: Yes, I think you are right to compare what Michael was talking about to a boddhisatva. My point is that I found his explicitly Christian language unfamiliar to me as a new attender 15 years ago, and I "get it" now. So, I would offer to you that I understand "salvation" to be universal, too, and I am comfortable couching it in terms of the Christian path for myself -- now. And I didn't used to be. Will, thanks for your comment. I have enjoyed and been enriched by your blog posts to date. I've never read anything as succinct, true, and useful as the Sam Caldwell piece you quote and always direct new inquirers about Quakers to it. I cannot say it any better, and haven't heard anyone else, either (including Fox and Barclay; they are anything but succinct). But here's the thing: His lecture is part of the Quakerism 101 curriculum (on the lesson on "Quaker Universalism") and I always look foward to the class where we discuss it. But when we do, I am astononished at the negative response it draws from so many self-professed Friends. They find it offensive, parochial, and un-Quakerly (!). I'm always baffled by this response, except that it reflects the success of modernism and post-modernism of wringing all the power out of religious language, and thereby religion itself. Re being saved: Kenneth Boulding was once asked how he knew he was saved, and he said, "When none of me is wasted." I like that, too. Oh yes, one more thing about universal salvation. The image came to me of a prisoner who has been pardoned but doesn't know it, or has been told but won't believe it. He's actually free. The gate is unlocked. He can walk out whenever he wants and never have to come back. He can't do anything to earn his freedom -- he's been given it --all he has to do is accept & exercise it. But until he does, his salvation doesn't have any practical effect on his life today; death is the only pardon he can understand and wait for. He's condemned. That's what saying one has to believe to be saved means. Of course, this doesn't mean anything to the person who doesn't realize he's in prison in the first place, does it? Or who has redefined his imprisonment as freedom. I also love Caldwell's quote (and his entire talk) and I keep it on my bulletin board as a reminder. In reading PaulL's last message, there is something of the prisoner analogy that bothers me. Many Christians think that "believe and be saved" is a one-time thing, and for some, it is more a matter of believing some fact like "Christ died for your sins". I don't think that PaulL is trying to convey that message, but I think the analogy could also be read in that way. The prisoner believes the fact that the door is unlocked and walks out. But the usage of the word "believe" in the New Testament is more about putting your trust in God - listening and obeying that inner guidance, and I think it is very much in line with the way Caldwell expresses it. Paul and I are Friends together in the same meeting, and I took Quakerism 101 at taught by Paul and another local Friend. The two of them did an amazing job. I was particularly delighted with how Paul kept a perfect balance between his own rather particular sense of what Quakerism should be, and his obvious love and respect for those of other understandings. Yet, I feel somewhat astonished at his astonishment toward the negative response of "self-professed Friends" to the Caldwell piece, and feel compelled to give it a knock. I powerfully disagree with the very first adjective in Caldwell's list of descriptors of the light: I do not see it as supernatural, but as an absolutely natural, though deeply mysterious, outgrowth of individual consciousness in relationship with the natural world, including other living beings. I can certainly understand how a reasonable person can conclude otherwise, but putting that at the very front of such a list strikes me as a terrible, almost idolatrous, distraction from the importance of the *experience* of the light itself. Believing that the light is supernatural or natural does not change what the light is; and such belief certainly has no place in dividing the saved from the unsaved. It is not important that we agree about the origins of the light; only that we know and follow it when we find it. This is the most substantial flaw in Caldwell's understanding for me, but I also do not see the light as eternal: if conscious life disappears altogether from the universe, as science overwhelmingly seems to predict, the light as I understand it will end. I'm not sure what Caldwell means by personal.It certainly dwells in each person, but I don't see it as coming from a personal source outside ourselves. Universal? Eternal? Again, I'm not sure I understand Caldwell's meaning, but without conscious beings the light as I conceive it has no meaning. And I don't think anything in human experience is pure. I see how good and reasonable Friends can disagree with me on any of these points. What I don't see is how agreement on such points is critical to a healthy Quakerism. In fact I think it is rather unhealthy to put such great emphasis on them. Beyond that, I find his holding up of Quaker faith over Quaker culture to be largely unhelpful. Culture is simply the sum total of how a distinctive people behaves; faith has myriad meanings, but when used as a synonym for a theological belief system, it's just a notion and has no place at the center of a healthy liberal Quakerism. If he'd said "faithfulness"--meaning, acting as we know we must in integrity and obedience to the light--then I would agree that is far more important than culture. But he uses the perfectly innocent word "culture" as an epithet, and I find him rather reactionary on this count. Finally, though, I am deeply moved by his sense of salvation as coming into"fullness and wholeness of life and right relationship with God, themselves, the universe, and one another." The word "God" doesn't add much from my perspective--particularly if it is meant as the being who created the universe--but it doesn't particularly detract, either. Other than that, what he describes is my greatest hope not only as a Quaker, but as a human being. Thanks for your thoughtful comment and engagement with the post. I admit to having felt a pause around the word "supernatural" in Caldwell's quote myself. It's evident from human history that there is in nature an experience that many people interpret as being "supernatural." Some forms of this experience can be labeled as religious or mystical experience. Clearly, too, humans are participants in the natural world, so such experiences must have some "natural" basis. What is that basis? I don't know. I'm comfortable labeling it "God" or "Christ." You also call out Caldwell's use of "personal" as a descriptor for the divine. For me, calling the divine "personal" is an accurate description of a human experience: for some people, this experience of what is labeled "the divine" in fact appears to them in the form of a person. Given that whatever concept we have of God falls short of whatever is really happening among us, for me it's enough to recognize this fact of "personal appearance." And there's a large body of Quaker history and experience that is expressed in the same language. As for culture, I hear Caldwell describing his personal experience of a dry-as-dust Quaker culture that doesn't energize people to help one another and the world. Its main concern appears to be to hold on to the pecularities or distinctives, rather than the original energy that has mobilized Quakers (and others) time and time again. Is his experience normative or an outlier? I don't know. I can say it resonates for me in some Quakers groups I've experienced. James, from this comment and some of your other writings, I do think our experiences, and even many of our understandings, are somewhat similar. Nonetheless, I do find that religious language, and specifically Christian language, works for me to express something that is at root inexpressible. So, I'm not troubled if Christian language not "literally" true. Similarly, a poem may work to express something for me even if I don't fully accept its premises. I've never claimed to be an orthodox Quaker Christian. And yet I continually find energy and inspiration in the Quaker Christian tradition. So be it. The question you leave me with is this: Given that I'm comfortable with this Quaker Christian language, and I'm interested in encouraging others to explore it because they might find it useful or refreshing, what do I say or do if they say "no thanks"? The question I leave for you is: How do you express your "faithfulness"? I believe I've already seen it both at the end of your comment here, as well as your story about how the meeting cared for you and your family in a time of great stress. Are there passages or writings by you or others that speak to your condition the way that Caldwell was speaking to mine? I'll end by saying, yes! yes! let us live into the fullness and wholeness of human life and right relationship, here and now. I do remember when I first read Caldwell's article, that I recognized a certain moralistic rigidity around petty concerns from my own Quaker "milieu"--I'll call it that because, in my experience of midwestern Quakers, it doesn't strike as either deep enough or broad enough to be called culture. He used the example of excessive concern over things like the horrendous sin of throwing away a styrofoam cup. I hear him loud and clear. I honestly support conscious attention to how our consumption ties in with the destruction of the environment and the economic exploitation of the third world. But I don't want to live in the shadow of guilt over every niggling little decision, and there are a handful of influential Friends who seem to want us to. In the end, I wouldn't trade my occasionally annoying community for the largely oblivious culture that surrounds us for anything; by and large I have the honor and great fortune to worship with the most beautiful, kind, thoughtful, loving group of human beings I ever hoped to know. If it seems like some of us aren't pulling our weight, then the others will just have to pull a little harder. That's how it works. It's also possible--even likely--that the Philadelphia Yearly Meeting culture of which Caldwell speaks is far more stultifying than my own. I really can't speak to that. Hmm. How do I express my faithfulness? Well, all too often I don't, I have to confess. In my Quaker community, I try to release the best of what I am into the our worship, our community, our business. Sometimes that expresses itself as silence, sometimes a spoken or written message, sometimes a laugh, sometimes a hug, sometimes washing the dishes. I care for my family. I open myself to being changed by the spirit of the Friends I most admire, and by the gathered power we sometimes--often, in my experience--find together. In terms of writings or art, my greatest inspirations are not of Quaker origin by and large, though I fully appreciate the genius of Fox and his cohorts, mainly for the boldness of their rejection of the stultifying religious forms of their time. I understand that they were firmly Biblical and theist and Christian, but the essential impulse that moved through them was that of freedom, not orthodoxy. Freedom from everything except conscience, which they envisioned as the light of God/Christ within. Yet, when I read them, there are great stretches where their understanding is completely alien to me. So I take what feeds me, and leave the rest for others. I don't really look for comfort in what I read, but honesty. Personally, Camus speaks to me far more deeply than Fox or Barclay, most centrally in the way he delineates the contradiction between our longing for understanding and eternity, and the intractable limits imposed on us by our human condition in the world. To deny either is dishonest; to accept both is to live in constant tension. Others who speak to my condition more than Fox: Dostoevsky, Kafka, Neruda, Bellow, Robert Stone, Denis Johnson, and countless others. It's not a very Quakerly list, is it? So be it. But living in my Quaker community and trying to live up to my light feels to me like a far better teacher of living Quakerism than reading Barclay. Oh, it just occurred to me, there are a couple explicitly religious texts that I find at least as spiritually electrifying as any of the writers I listed above. First and foremost is the Book of Job. I think it might be the greatest existentialist work I have ever read, and the tension it portrays has a powerful link to what i find in Camus. God/the universe is not what we think it is. It is not wise to think of God as just, or as our buddy. It gives us everything, and it takes everything away. Also, the story of Abraham and Isaac, for similar reasons. I find the conventional Christian interpretations of these two breathtaking stories--interpretations that insist on the "goodness" of God--naive beyond comprehension. "faith has myriad meanings, but when used as a synonym for a theological belief system, it's just a notion and has no place at the center of a healthy liberal Quakerism. If he'd said "faithfulness"--meaning, acting as we know we must in integrity and obedience to the light--then I would agree that is far more important than culture...."
I sympathize very much with these sentiments, but I just don't think that it is practically, even logically, possible to be completely devoid of any theological belief system -- even your description of faithfulness is a barebones theology. The real question is not whether we'll have a theology, but whether we'll have a simple and inclusive one or a complicated and exclusive one. I think it's a worthwhile point to make because while I don't want to lose the openness that liberal Quakerism has, the particular barebones theology grounding it is less important. Specifically, I think the main problem with liberal Quaker "theology" so to speak is that it gives virtually no guidance for how we are to tell what is "the light" -- and what is something else? What is the "natural, though deeply mysterious, outgrowth of individual consciousness in relationship with the natural world, including other living beings", and what is superficial, shallow stuff? If all we say is such an experience exists and that if we "listen" we can find it, what do we do for people who can't or don't find it? I think a lot of less universalist Friends have this itch, and that many of them scratch it with traditional Quaker Christianity (or nontraditional Quaker Protestantism), because that seems to give a fuller description of what the light is. But I think we might find fuller descriptions of what the light is that are still universalist and nontheist-friendly -- Rex Ambler's work I think goes in this direction -- and I think we should stay open to that. Actually, I think it's fair to say I have a pretty strongly developed theology of a sort, or perhaps an "atheology." A world of great suffering,with no loving deity to protect or comfort us, is a world in which we need each other desperately. Without each other we are lost. My faithfulness is grounded in my particular sort of atheism, rather than arising in spite of it. So, I do not believe for a minute that theology, a world view deeply integrated with one's spiritual life, is unimportant. What I think is unimportant--not only unimportant but in fact contrary to the deepest,most genuine religious community--is for us to all have the same theology. We need the foundation of love, yes, but we do not need to agree on where it comes from. We need to love out of our own integrity, and into the integrity of one another. Regarding how to tell the light from what is not the light: I won't say it's easy, but I think it's not nearly as hard or mysterious as we think it is. Particular decisions can be terribly hard, but not because the good itself is hard to recognize; but because in real life the good gets mixed up with the bad, and the most important decisions are not pure but conflicted. Also, doing the right thing can be inconvenient, even frightening. The good itself, though...it is love, kindness, generosity, openness to new light wherever it comes from, and however much it might threaten our prejudices. I've never read Rex Ambler--would be curious to know more. I would like to express my appreciation to everyone who has commented, in particular James and Zach in the last couple of comments. I especially liked James' coinage of "atheology." This has been a rich and rewarding discussion, and I haven't had time to keep up with it. This is the kind of conversation I'm looking for as part of deepening my spiritual practice. Not everyone may use the same language as I do, and yet I feel like we are kindred. And of course, even kinfolk have squabbles; if Quakers do, too, then it just means it's part of the work we have to do together. Johan Maurer: Can You Believe? Rebecca Sullivan: The New Young Elder etcet.